Julia Konya over at Cuckoo 4 Design has transformed her backyard garden into a cat-safe outdoor environment for her three cats. Julia's design background and passion for her cats has inspired these wonderful structures that allow her cats to spend time outside while they are protected from a neighborhood threats. 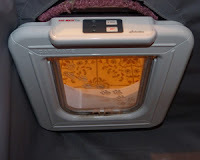 Her cat-safe enclosures are constructed in various places that compliment the terrain and environment and they are connected by access tunnels that begin at one window of her home. These kinds of structures are inexpensive to purchase, and fun to build. You can be as creative as you like by using different-colored wire mesh, and staining or painting the wood, etc. In her blog, Julia explains every detail of construction. As always you can find additional information right here as well, at catcluez.org. We feed our cats only pure meat treats - usually freeze-dried salmon, duck or turkey. We use treats for a "garnish" on our cats' regular food, to make it more interesting to them. This usually means crumbling the small crispy treats by hand which can get messy. I thought there must be some kind of kitchen gadget that could chop the freeze-dried treats into granular bits, or even to a powder that could be sprinkled on the cats' food directly where I wouldn't need to use my fingers to crumble the treats. Doing it by hand sometimes results in some of the bits getting on the counter as well, and some treat pieces are less than completely dry, which can be a bit objectionable. I found this product in a local kitchen store. It's a rolling garlic chopper. Garlic cloves are put inside the receptacle which has tiny rotating blades. The receptacle is closed and the device is rolled along a hard surface. Little wheels turn gears which spin the blades and chop the garlic inside. I tried this product with several treat products we have. 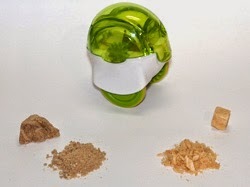 One is freeze-dried salmon, the other is freeze-dried duck liver. The salmon pieces are roughly 1/4" cubes, the duck pieces vary quite a bit in size. I dropped a couple pieces into the receptacle, closed it and rolled it back and forth a couple times. The more you roll it the finer the "grind." The receptacle is colored transparent plastic so you can guage your preferred texture. When I had the consitency I wanted, I opened the receptacle and just dumped it on the cat food. Knock it against the bowl to dislodge any reluctant granules. The garlic chopper worked like a charm with both treat types. "GarlicZoom" is made by Chef'n. 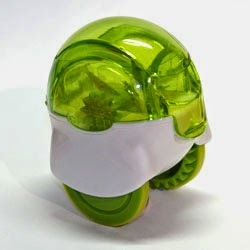 It is BPA-free and top-shelf dishwasher-safe. I've talked about this before, and my convictions come from personal experience. 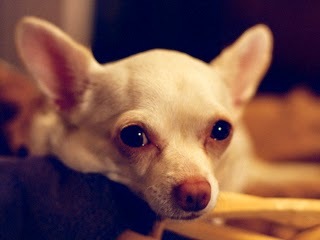 I want to stress how important it is for your cat (or dog) to avoid eating dry food (kibble). Dry pet food is not really food, it causes long-term health problems, many of which are not discovered until it's too late. Please consider putting your favorite domestic critter on a permanent raw pet food diet or at the very least, a quality canned food diet. Many small independent pet food and supply stores have knowledgeable staff who care about your pet's well-being and their products' quality. Talk to your vet and seek guidance from people who care. Based on my own experience and stories from others who have made this bold change, I am confident you too will have a healthier and happier pet, potentially significantly lower vet bills, and you may very well extend your pet's lifetime - a tremendous gift to your pet, and yourself as well. This product will now operate from your cat's ID chip in addition to operating with RFID collar tags. I can't tell you how many different pet doors I've gone through. I still have a box full of them. I have used many different types from very basic, to advanced electronic versions which recognize only your own cat. One electronic pet door stands out from the rest as a great product which just works, 100% of the time. 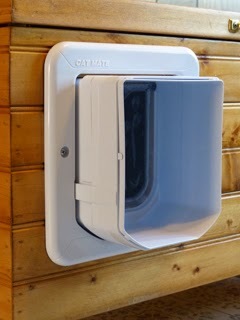 The Cat Mat(R) Elite Selective Electronic Cat Flap is one of those products that just works. It is quite sophisticated, but well-made and practical. It uses RFID (Radio Frequency Identification) technology to only allow pets with either veterinarian-implanted ID chips, or RFID collar tags to come and go through the flap. It will support up to 16 individual pets. The collar tags are now sold separately. They are non-magnetic and do not use any batteries like some other products. The cat flap unit includes an integrated weather strip, and hardware for installation in doors up to 2" thick. You can also order a wall-install liner separately. Programming requires a little concentration, but the included printed instruction booklet is very good. The unit uses 4 "AA" batteries and is very good on battery life. It can be set for "In and Out", where pets wearing the collars can come and go freely, "In Only", so pets can only come in and not go back out, "Out Only", so pets can go out and not come in, and "Locked" which prevents any pets from passing through the door. The current unit will recognize up to 16 cats. Your cat pushes on the clear hard plastic flap, the unit scans for a recognized ID chip or collar tag, and opens the flap. It operates the same in both directions. Unless a cat has an ID chip or is wearing one of the RFID tags, it cannot pass through the flap. Of course, as with any new thing in your cat's life, she may require a little training. It is not difficult if you are consistent and persistent. The manual includes a section on training your cat to use the product. My cats were already used to pet doors so they took to it fairly quickly. I have purchased one of the ID chip units and 2 others since 2008. The older ones are still working perfectly. It includes mounting screws and a 3-year guarantee. I love that my cat doesn't need a collar tag now to operate the unit, our cat loves to take his collars off and lose the tags. Comes with everything you need to install and set up (except collar tags and batteries). 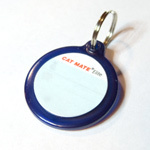 If you opt for using the collar tags, they are a little large for a cat (1.25" diameter). The unit cannot be set to allow a cat to pass through if the batteries die. So, if the unit's batteries are dead when your cat tries to use the door, it will not operate, so kitty could get stuck outside.